Rory McIlroy is on the verge of turning consistency into a stream of silverware, according to European Ryder Cup captain Thomas Bjorn. And the man himself agrees with that bold assessment, even if his attempt to be an "eternal optimist" is being put to the test by seeing chances for high-profile victories slip through his fingers. McIlroy won the Arnold Palmer Invitational in brilliant style earlier this season, carding a final round of 64 at Bay Hill to win by three shots and claim his first victory since the week before the 2016 Ryder Cup. But the 29-year-old has also struggled to convert several other opportunities, most notably when chasing the career Grand Slam in The Masters and failing to convert a three-shot halfway lead in the BMW PGA Championship at Wentworth. 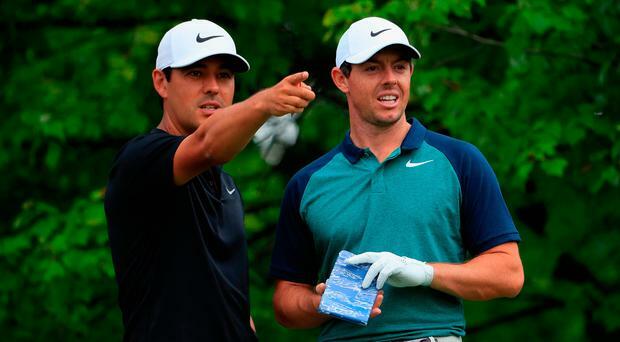 McIlroy also enjoyed a share of the lead late in the final round of The Open at Carnoustie before settling for a tie for second and struggled to a closing 73 in the WGC-Bridgestone Invitational in Akron on Sunday. "I think he's in a place where he's contending every week and as a player you go through spells where you don't quite get over the line," Bjorn said ahead of the US PGA Championship at Bellerive Country Club this week. "He's in a place where it's going to go 'boom' and then he's going to start winning a lot of golf tournaments again, and that's actually pretty good fun to watch." Ulsterman McIlroy would certainly appear to be suited to the wet conditions at Bellerive and compared the course to Valhalla, the venue for his second US PGA victory and last Major title to date in 2014. "I've kept giving myself chances," the former World No.1 said. "I haven't closed out those tournaments as I would have liked, but at least I'm putting myself in position, and that's all I can do. "I've done well, I'm slowly getting back up the world rankings. I started this year at 11th, I'm back up to fifth. I've done a lot of good things. The only thing I haven't done is win enough. "I played in a lot of final groups and I haven't played well enough when it's counted. So that's something that I'm just trying to go through and try to figure out what I need to do to make that little step from contending and getting into final groups to lifting trophies. "From 2014 I've given myself some half chances at Majors. I think my best chance since Valhalla was at Carnoustie, but in golf you just have to be an eternal optimist. "You have to make the most of everything, you have to see the positives and just move on and forget about it and that's what I've tried to do this year. The times where I haven't won and I haven't played my best, I try to learn from it and I move on. There's no point in reflecting on it too much or dwelling on it. "You just have to turn up to the next tournament and it's a fresh start. And even this week's a fresh start for me after what happened on Sunday. It's another chance to give myself a chance to win a golf tournament." Meanwhile, Tiger Woods admits he will have plenty of homework to do as he looks to claim a 15th Major. Woods was among the players due to compete at Bellerive in 2001 when the WGC-American Express Championship was cancelled due to the 9/11 attacks. "I literally haven't set foot on this golf course since that week in 2001," Woods said. "I didn't get up here pre-Open and (Monday) I took the day off. "Today we only got in five holes and didn't get a chance to see a whole lot, so I'll have to do some more homework tomorrow and get a good feel for what's going on for the rest of the week. "I needed that day off in the ice bath trying to get some inflammation down. There's going to be days that I'm just not going to have the speed, flexibility and movement I once did. I'm 42 now and I've had four back surgeries. It's just about managing it."